Hi everyone! Thanks for stopping by! 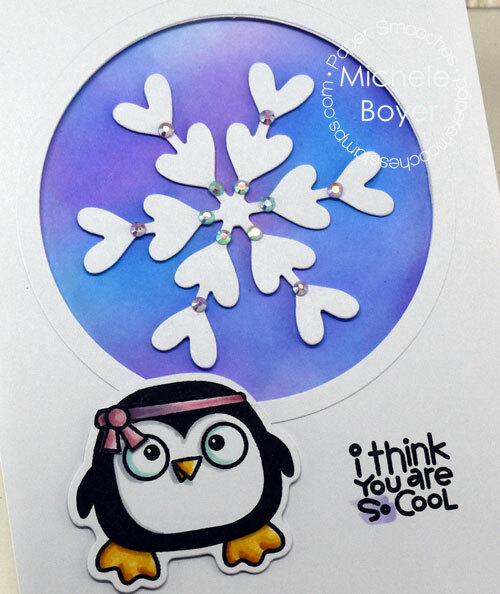 Today I’m sharing a fun card using Chilly Chums and Lovely Snowflake die from Paper Smooches. I first created the background by sponging Wilted Violet, Salty Ocean and Picked Raspberry Distress Oxide Inks. I think it’s a lovely combination. The snowflake was adhered using small pieces of clear foam squares, then Queen & Company‘s Gems were added for a bit of sparkle. Cute little penguin was colored with Copic markers and also adhered using clear foam squares.